The Fort Worth and Denver City railroad established Rowe as a shipping point for cattle in 1890. The name is credited to Alfred Rowe, the English immigrant rancher who founded the RO Ranch. A post office opened the following year and the streets were named and the town was platted in 1893. The town soon developed all the essential businesses including school, bank, newspaper and passenger depot. By the time the 20th Century arrived, Rowe was ready and horizons seemed limitless. 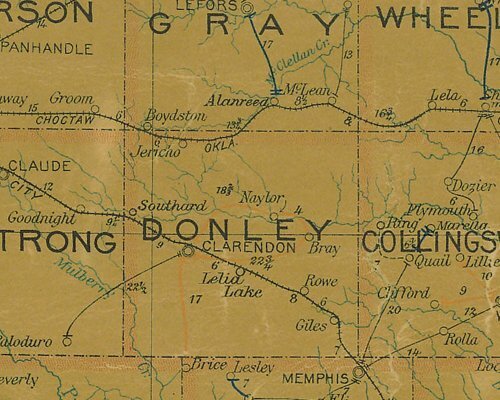 But considering the geography in this part of Texas, many towns enjoyed limitless horizons. 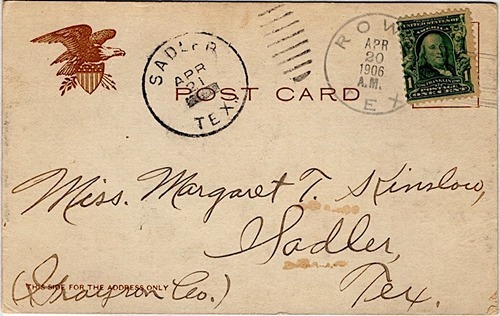 Disputes arose on the way the town was being managed - and in 1907 disgruntled residents were moving their houses and businesses (including the post office) about a mile to the southeast. Rowe was abandoned and in its place, the town of Hedley grew. The old Rowe cemetery sits alongside FM 1932 - just a mile N or Hedley on FM 1932. My great grandmother is buried in Rowe, Texas. A lot of my family came from Texas and they still live all over it. Here is another piece for you - Reaves burned down Rowe, Texas because he owned the land where Hedley now sits. This can be verified. My great-great-grandfather was Omel Hill ( O.C. Hill) or M. Thomas Giovanni Augustino - both were the same person. He is also buried in Rowe. The only Hill left is [a relative] who lives in Amarillo. My dad Otho Bain (1923-2000) was born in Claude which was named after Uncle Claude Bain. Clarendon was named after grandmother Clarise Hodges Bain. They felt it might jeopardize them [by revealing] their location to bounty hunters who wanted my family dead; so it was called Clarendon.